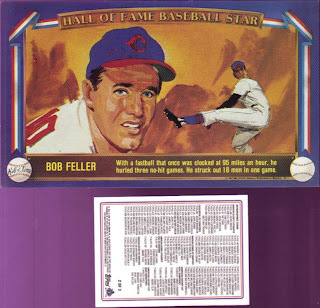 What you see above (the 'way' above) is a 1982 Davco Publishers Bob Feller card. It is one of the many oddball Tribe items I own. The card is printed on heavy stock, though not thick. It's one of my favorite oddballs because I haven't seen many like it. And, of course because it features the great "Rapid" Bob Feller! 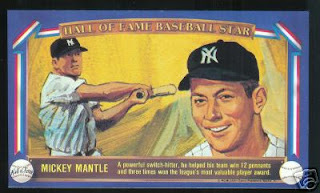 The card itself is actually part of a 25-card Hall of Fame set. They have blank backs. Each has a painted scene of the player being depicted. The tag line reads: "(c)MCMLXXII Davco Publishing, Skokie, Ill."
You can actually find complete sets online, if you're looking. Individual cards can also be had, though those are actually harder to find than complete sets. Go figure. A few days ago, I received an e-mail from Matt at Collected Studio. He told me about a project that he had recently done involving baseball cards and furniture. That piqued my interest. I went to his site and found this. 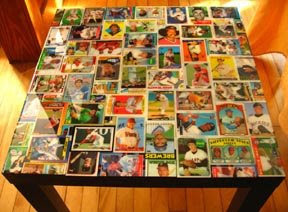 A detailed post about the making of this baseball card coffee table. Included is a YouTube video of the making of this piece of art. I was digging the Animals song on the video. It's one of my favorites and I've been bugging my friend to learn it, so we can record it. That's a bit off track, but so what. Matt sells these custom tables out of his studio, according to the video. I think this is a great way to use unwanted cards as art. We all have piles of early nineties and late eighties cards that are just taking up space. Why not sacrifice those doubles in the name of art? Matt has done this process with everything from a lazy susan to mirrors. There's even a snack tray lined with cards and a card storage box. It just goes to show that with a little creativity, you can turn a five cent card into a masterpiece. Thanks for sharing this project, Matt! This year, Topps tried to go stealth on us. In April, Wal-Mart was supposed to sneak indistinguishable blasters into the mix with the regular 2009 Topps blasters. Well, Wal-Mart being Wal-Mart decided to mix them in a month early. 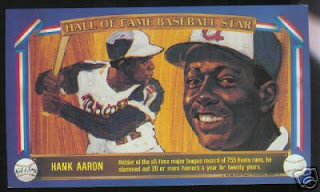 While the product reached the shelves unannounced, the immediate reaction was mixed upon the card collecting community. Some were elated. Some were confused. Some were mad. Some even tried to make a quick buck on eBay. 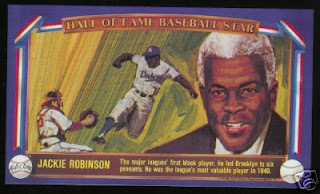 After the initial dust had settled, Topps in a rare openness, revealed the information about this variation. They included the UPC numbers that identified the blaster as having "black" cards. Topps also confirmed that a different variation was planned for Target stores and gave the UPC numbers for that variation. I think Topps did the right thing when first confronted. Normally, the word would be deny, deny, deny. I, and many others, appreciated the honesty and frankness of Topps. This makes the madness of a variation project like this, fun and smile inducing. As for the cards themselves... they look great, in person. They don't scan so well, but they scan well enough. Some people have nothing better to do than to put the cards up to their nose and sniff. There is a faint odor to the cards, but you really wouldn't notice it unless the card was millimeters from your face. The cards look absolutely gorgeous. The background is darkened and the player is not. This creates a spotlight effect on the player. The result is spectacular on most cards. 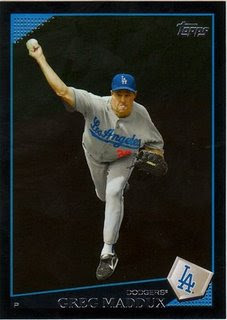 How would you like to be facing Greg Maddux highlighted, while everything else is blackened? His fastball about to come out of his hand looks fierce. Greg looks scary, as everything else is gone. I would not want to face him in this scenario. Truthfully, I wouldn't want to be in the batter's box against Maddux in pristine conditions. This would scare the life out of me, if I was a batter!